I’m seriously regretting my decision to postpone my lunch until after writing this post because looking at these pictures is making want to face plant myself right into those juicy berries. ….Not to be overly dramatic or anything….I mean, when has being hungry ever made anyone a edgy? Making this dish is really just a matter or whisking together the dry ingredients, stirring in the wet ingredients and then folding in your berries. Transfer the oat mixture to your baking dish or choice and then top with the simple, spiced nut mixture. I’ve listed walnuts in the recipe here but feel free to use another type of nut/seed if you like. 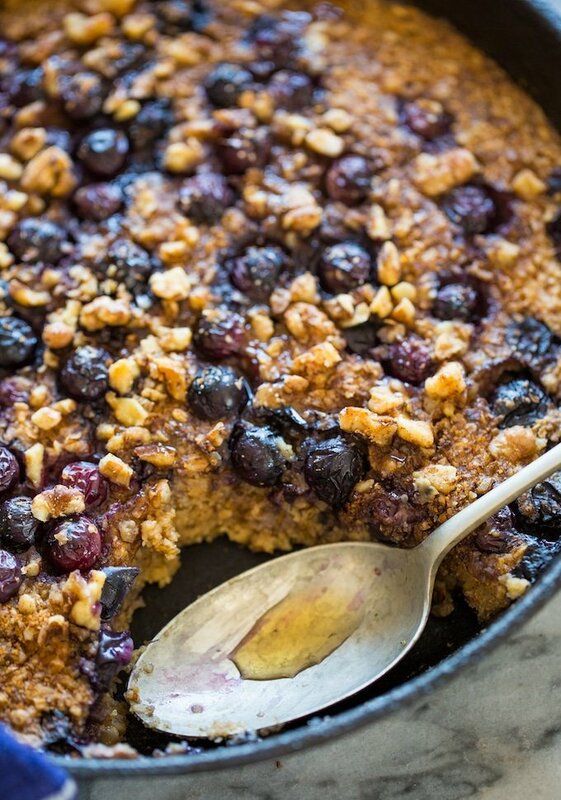 I like serving this with a drizzle of maple syrup over the top but that part is totally optional if you’re looking to keep the sugar down. As I mentioned above – this recipe has a LOT of flexibility. Blueberries can be swapped with other berries/fruit depending on what you’ve got: strawberries, apples, banana etc. 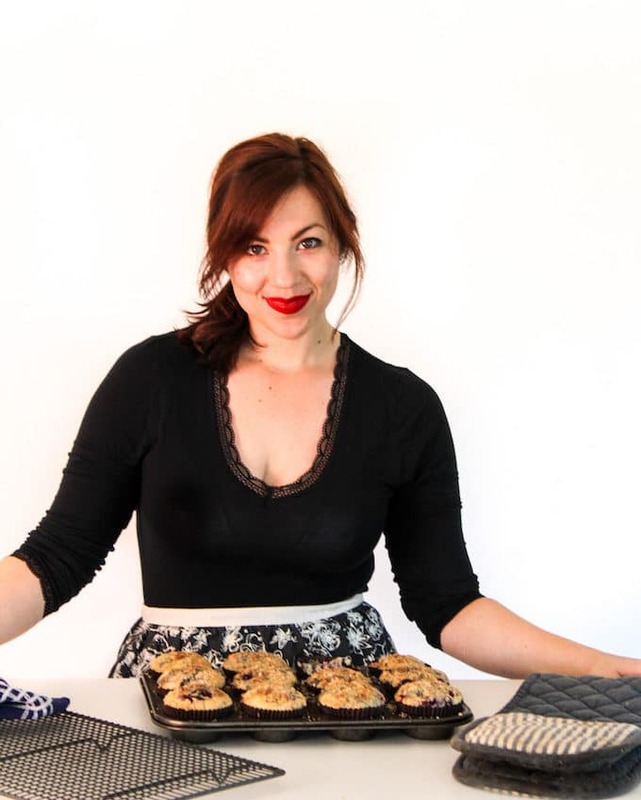 While chocolate chips aren’t exactly fruit I wouldn’t personally say no to a chocolate studded baked oatmeal. Leftovers can be kept and stored covered in an airtight container for about 3-4 days. Just pop it in the microwave for about 60 seconds to warm it up and you’re good to go! 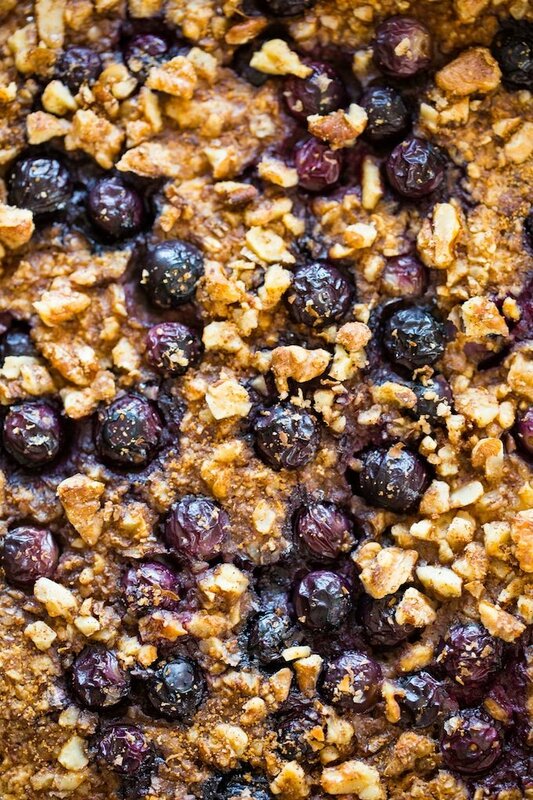 Don’t forget to #asaucykitchen on instagram if you try this Blueberry Oatmeal Bake. I love seeing what you make! You can also post your pictures to my facebook page! In a medium sized mixing bowl mix the oats, baking powder, cinnamon, nutmeg, sea salt and sugar until combined. Stir in the milk, vanilla extract and flax eggs whisk until combined. Gently fold in half of the blueberries. Pour the batter into the prepared baking dish. Scatter the remaining half of the blueberries over the top. In a small cup or bowl combine the walnuts, cinnamon and coconut sugar for the topping. Spread the topping over the top of the oat mixture. Place in the oven and bake for 30-35 minutes until the oats are set. 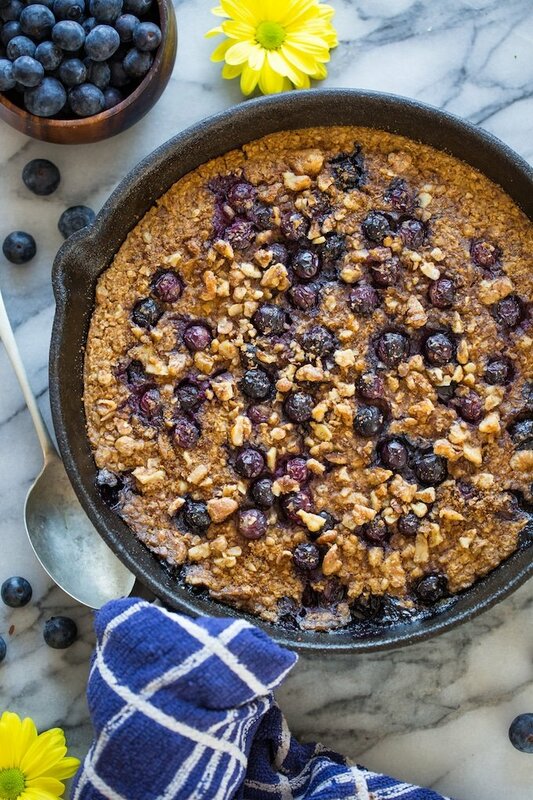 Serve with a drizzle of maple syrup over the top and enjoy. How to make the flax eggs: In a small bowl whisk together 2 tablespoons ground flax seed with 6 tablespoons water. Set aside in fridge for 5 minutes allowing the flax to gel up. You can use rolled oats instead of quick oats but you'll need to increase the cook time by about 8-10 minutes. You can swap out the coconut sugar for another sweetener of your choice. This was delicious. Will be making it again this week! Thanks Joy! So glad you liked it! Can I use regular sugar? What is coconut sugar? That would work! Coconut sugar is like a mix between brown sugar and white sugar – it’s derived from coconut palm and is usually less refined than normal sugar making it popular in healthier/paleo baking. Made this with my toddler for breakfast over the weekend and it was a hit! Very yummy! Aww so glad you guys enjoyed it! Thanks for coming back to let me know what you thought! No worries! Chia eggs will work! Can I refrigerate this overnight and bake in the morning? Absolutely! Hope you like it! Looks sooooo good! Perfect for the summer!